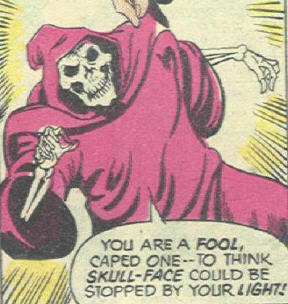 Powers/Abilities: Skull-Face presumably possesses the power of telepathy, as he has no internal organs with which to speak. His lack of eyes makes him immune to what would otherwise be blinding flashes of light; possibly he is also immune to illusions. His only truly offensive maneuver is to bite or throttle people. History: (Mystery Tales#6)- A group of movie producers decided to revive a classic horror movie from 15 years before, one called "Skull-Face," and started a massive ad campaign to raise interest; this involved newspaper hype, having airplanes sky-write (or sky-draw, I guess) giant skulls in the sky, and the like. But producer Tom Fenton wanted something with a litle more zing, so he decided on the following publicity stunt: he found in some antique dealer's shop an antique skeleton said to have been that of someone burned at the stake centuries before for "being a demon." Then he took it to some crackpot scientist named Professor Thornton, who strapped it into a kind of high-tech electric chair, where he blasted it with 50 million volts of electricity, non-stop, 24 hours a day, in the hope that ultimately this process would revive it (!) The producers didn't buy all that nonsense, but they thought it would make a great story, and so it was reported that "the original skeleton used in the movie" was being revived and would soon appear to speak about the film. Of course, it turned out the process DID work, and the skeleton came alive, only to kill Professor Thornton and Tom Fenton -- he really had been a "demon" after all. 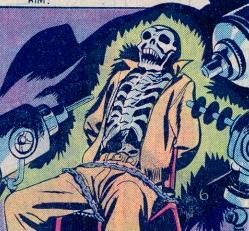 The revived skeleton then left the room of one of his victims, presumably to go on a killing spree. (What If I#9)- In 1958, Skull-Face was one of several superhuman associates gathered by the Yellow Claw as part of his scheme to capture President Eisenhower. They succeeded in bringing the president to the Yellow Claw's base, but were followed by the Avengers. 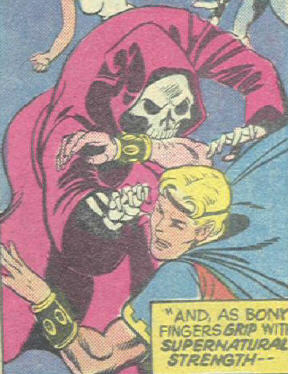 In battle against Marvel Boy, Skull-Face was thrown by Gorilla-Man into his comrade, the Cold Warrior. Upon striking the Cold Warrior, Skull-Face shattered into pieces. Gorilla-Man subsequently used one of Skull-Face's bones to club the Great Video over the head. Comments: Created by Stan Lee and Tony DiPreta. Information from Mystery Tales#6 comes from my good friend Crusher Hogan, owner of a vast Timely-Atlas collection. Thanks again, Crusher! Crusher notes that: "Why a demon would have a skeleton is left unexplained! -- perhaps what was meant was that the guy whose skeleton it was was possessed by a demon." Or another questions might be: Why wouldn't one?--Snood. Outside of walking around and being...well, a skeleton, Skull-Face really didn't pull his weight in Yellow Claw's team. A note on the Avengers of the 1950's: In the Avengers Forever limited series they were seemingly ret-conned out of existence. However, in a personal communication with Kurt Busiek (on Avengers Message Board), he specifically stated that he did not wipe the Avengers of the 1950s from existence. One alternate timeline containing them was wiped out. The group may well have existed in the mainstream past, but they just weren't called the Avengers. He suggested the name: "The G-Men"
Our own Omar Karindu speculated that the long-dead sorcerer who became Skull-Face was actually Thulsa Doom. This Robert E. Howard character was quite the powerhouse in the Pre-Cataclysmic and even in the Hyborian Eras, but he could well have fallen on hard times in the last 12, 000 years. Now that would be a cool story, I think--Snood.